A designer and her husband renovate their Nantucket house, ensuring plenty of room for their family and the laughter, joy, and memories they bring. Designer Nancy Serafini and her husband, Joe, turned their one-story, three-bedroom cottage on a quiet Nantucket street into a spacious—but still charming—house with plenty of room for their grown children and a passel of grandchildren. A seat for everyone was the goal in the living room, where a pair of John Duckworth photographs stands in for views. Creamware pitchers decorate the coffee table. The prevailing theme is blue and white in a variety of patterns and textures. Nancy displays her favorite antique dishware on the living room’s bookshelves and coffee table. The staircase leads to the new second floor and connects the main part of the house to Nancy’s office and a guest suite. The kitchen has a view through the entryway into the dining room; Tony, the couple’s Wheaten Terrier, keeps a watchful eye from his spot in the hall. Blue and white show up again in the Caskata dinnerware Nancy uses to set the kitchen island for breakfast. Nancy’s father, a B-17 pilot in World War II, left her the two Toulouse-Lautrec prints that now hang in the master bedroom. She chose a color scheme to complement them. The second-floor landing has become a gallery for the art Nancy and Joe didn’t previously have the wall space to collect. Nancy and Joe Serafini’s Nantucket home is not always perfect. On sunny days when there’s not a New England Home photo shoot going on, the pillows on the sofas are smooshed into cozy submission by the couple’s grown children and their spouses. One of the antique ironstone pitchers decorating the large coffee table may be at the end of a grandchild’s foot as he clomps about, shrieking with delight at his own cleverness. Tony, the couple’s Wheaten Terrier, may be trolling the floor around the kitchen island for Cheerios flung by grandchildren too adorable to scold. But even when it’s not at the peak of photo-shoot prettiness, the Serafinis’ home is about as picture-perfect a family place as one could wish for. Grandkids and Cheerios and dog included, this is a dwelling built to make and hold memories. Back in 1985, when the couple found this property, the single level, three-bedroom, 1,600-square-foot house was great for their then-small family. A series of upgrades came with each decade. Joe’s father designed a small addition in the mid-1990s, and in 2005 the couple redid the kitchen and added a master bath. But the real commitment came in 2013 when they sold their Boston apartment and decided it was time to truly renovate and add on to their island abode, making it a more permanent home with room for their two married children and five grandchildren as well as guests. 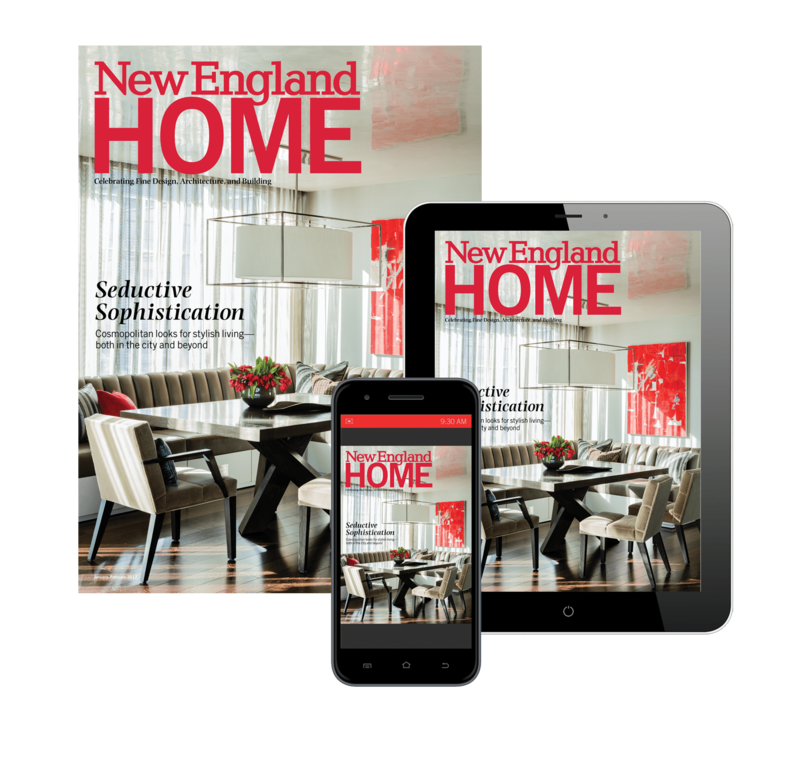 “We took off about 75 percent of the house, kept most of the rest, and added on,” says Catalano of the nine-month process. The results are rewarding. From the antique chestnut floors (replacing the original pine) to every ceiling, crown, and cabinet detail, the architect and designer, along with builders Les Fey and Will Gorman, created a classic. The L-shaped house has two entrances: the first is the original front door, which was moved closer to the street to accommodate the stairs leading to the new second floor, while the second enters upon a hallway that connects the dining room with the kitchen and living room. Those rooms, plus the master suite, laundry, mudroom, offices, and a guest suite, occupy the first floor. The second floor holds the other bedrooms. She kept almost everything from the previous house, re-covering it or using it in a different way. Her biggest challenge was furnishing the living room. While not large, it has a seventeen-foot ceiling and is open to the airy, all-white kitchen. “Scale was a real issue,” she says. A pair of Verellen sofas and two swivel chairs face the blue-and-white-tiled fireplace. Built-in bookcases to either side hold art and design books as well as beloved pieces of Barge ware and blue-and-white Canton pottery. Between the windows overlooking the backyard are two photographs by John Duckworth that seem to give the room its own ocean view. Favorite shades of blue pop up in the William Yeoward print on the wing chairs in the living room as well as in the J.D. Staron rug and the sofa’s Dransfield & Ross pillows. A striped linen fabric from Raoul that covers a high-backed bench in the dining room helps broaden the palette, adding oatmeal and green to the blues. Blue and white Duralee fabric hangs from floor to ceiling in front of the windows and covers a chaise longue. A red lacquered accent table resides next to a wingback chair covered in a red, blue, and white William Yeoward fabric. 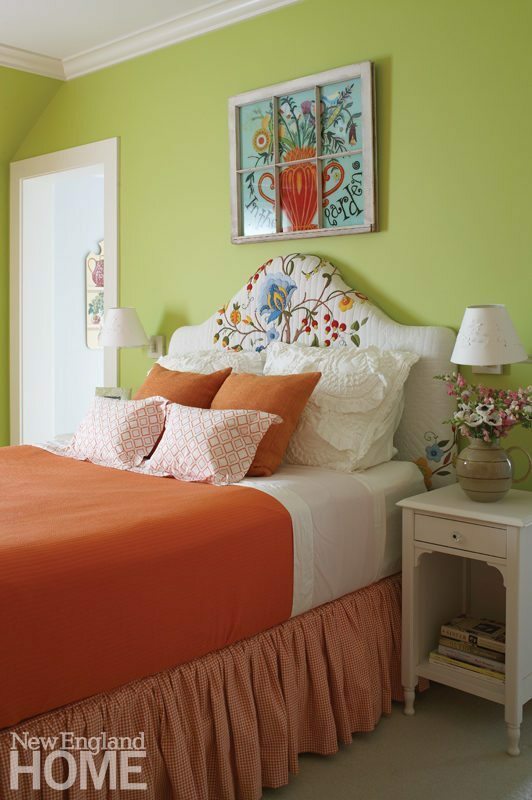 For the guestrooms, Nancy took a few more liberties with color, decorating one in shades of mango and lime and another with green walls and blue and white linens. Most important, everyone has a spot, whether it be for lounging or sleeping or gathering at the dining room table that seats fourteen.